Who said it wont fit ! Heat exchanger tube sheet bundle in for modification, thinking out of the box to get the job done. 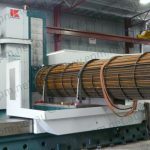 Check out www.epm.net.au for a full list of machines and workshop capabilities.